His works are often considered as frank examinations of the modern condition. His early works reflect a mastery and Americanization of the Theatre of the Absurd that found its peak in works by European playwrights such as Samuel Beckett, Eugène Ionesco, and Jean Genet. His middle period comprised plays that explored the psychology of maturing, marriage, and sexual relationships. Younger American playwrights, such as Paula Vogel, credit Albee's daring mix of theatricality and biting dialogue with helping to reinvent the post-war American theatre in the early 1960s. Later in his life, Albee continued to experiment in works such as The Goat, or Who Is Sylvia? (2002). 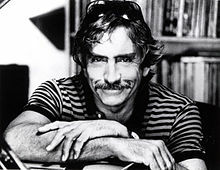 Edward Albee was born in 1928. He was placed for adoption two weeks later and taken to Larchmont, New York, where he grew up. Albee's adoptive father, Reed A. Albee, the wealthy son of vaudeville magnate Edward Franklin Albee II, owned several theaters. His adoptive mother, Reed's third wife, Frances (Cotter), was a socialite. He would later base the main character of his 1991 play Three Tall Women on his mother, with whom he had a conflicted relationship. Albee left home for good when he was in his late teens. In a later interview, he said: "I never felt comfortable with the adoptive parents. I don't think they knew how to be parents. I probably didn't know how to be a son, either." In a 1994 interview, he stated that he left home at the age of 18 because "[he] had to get out of that stultifying, suffocating environment." In a 2008 interview, he told interviewer Charlie Rose that he was "thrown out" because his parents wanted him to become a "corporate thug" and did not approve of his aspirations to become a writer. Albee moved into New York's Greenwich Village, where he supported himself with odd jobs while learning to write plays. Primarily in his early plays, Albee's work had various representations of the LGBTQIA community often challenging the image of a heterosexual marriage. Despite challenging society's views about the gay community, he did not view himself as an LGBT advocate. Albee's work typically criticized the American dream. His first play, The Zoo Story, which was written in three weeks, was first staged in Berlin in 1959 before eventually premiering Off-Broadway in 1960. His next play, The Death of Bessie Smith, similarly premiered in Berlin before arriving in New York. Albee's most iconic play, Who's Afraid of Virginia Woolf?, opened on Broadway at the Billy Rose Theatre on October 13, 1962, and closed on May 16, 1964, after five previews and 664 performances. The controversial play won the Tony Award for Best Play in 1963 and was selected for the 1963 Pulitzer Prize by the award's drama jury, but was overruled by the advisory committee, which elected not to give a drama award at all. The two members of the jury, John Mason Brown and John Gassner, subsequently resigned in protest. An Academy Award-winning film adaptation of the controversial play was released in 1966 starring Elizabeth Taylor, Richard Burton, George Segal, and Sandy Dennis. In 2013, the film was selected for preservation in the United States National Film Registry by the Library of Congress as being "culturally, historically, or aesthetically significant". According to The New York Times, Albee was "widely considered to be the foremost American playwright of his generation." The less than diligent student later dedicated much of his time to promoting American university theatre. Most recently, he served as distinguished professor at the University of Houston, where he taught an exclusive[clarification needed] playwriting course. His plays are published by Dramatists Play Service and Samuel French, Inc.
A member of the Dramatists Guild Council, Albee received three Pulitzer Prizes for drama—for A Delicate Balance (1967), Seascape (1975), and Three Tall Women (1994). In 2008, in celebration of Albee's 80th birthday, a number of his plays were mounted in distinguished Off-Broadway venues, including the historic Cherry Lane Theatre where the playwright directed two of his early one-acts, The American Dream and The Sandbox. Albee was openly gay and stated that he first knew he was gay at age 12 and a half. Albee was briefly engaged to Larchmont debutante Delphine Weissinger, and although their relationship ended when she moved to England, he remained a close friend of the Weissinger family. Growing up, he often spent more of his time in the Weissinger household than he did in his own, due to discord with his adoptive parents. Albee insisted that he did not want to be known as a "gay writer," saying in his acceptance speech for the 2011 Lambda Literary Foundation's Pioneer Award for Lifetime Achievement: "A writer who happens to be gay or lesbian must be able to transcend self. I am not a gay writer. I am a writer who happens to be gay." His longtime partner, Jonathan Richard Thomas, a sculptor, died on May 2, 2005, from bladder cancer. They had been partners from 1971 until Thomas's death. 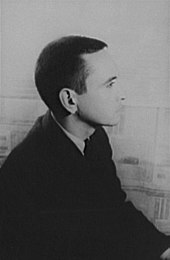 Albee also had a relationship of several years with playwright Terrence McNally during the 1950s. Albee died at his home in Montauk, New York, on September 16, 2016, aged 88. He had lived in Tribeca. 2003 Fitzgerald Award Award for Achievement in American Literature award which is given annually in Rockville Maryland, the city where Fitzgerald, his wife, and his daughter are buried. ^ a b Weber, Bruce (September 17, 2016). "Edward Albee, Trenchant Playwright for a Desperate Era, Dies at 88". The New York Times. ^ Thorpe, Vanessa (September 17, 2016). "Edward Albee, Who's Afraid of Virginia Woolf? playwright, dies aged 88". The Guardian. Retrieved September 17, 2016. ^ a b Markowitz, Dan (August 28, 1994). "Albee Mines His Larchmont Childhood". The New York Times. Retrieved March 8, 2017. ^ a b Simonson, Robert (September 16, 2016). "Edward Albee, Towering American Playwright, Dies at 88". Playbill. Retrieved September 17, 2016. ^ a b Boehm, Mike (September 16, 2016). "Edward Albee, three-time Pulitzer-winning playwright and 'Who's Afraid of Virginia Woolf?' author, dies at 88". The Los Angeles Times. Retrieved September 17, 2016. ^ "Edward Albee Interview". Academy of Achievement. June 2, 2005. Retrieved May 21, 2012. ^ Edward Albee on Charlie Rose, May 27, 2008. ^ Kennedy, Mark (September 16, 2016). "Who's Afraid of Virginia Woolf? playwright Edward Albee dead at 88". Associated Press. Retrieved September 17, 2016. ^ a b c Griffin, Gabriele (2002). Who's Who IN LESBIAN & GAY WRITING. 11 New Fetter Lane, London: Routledge. pp. 2–3. ISBN 0-415-15984-9. ^ "Plays Produced in the Provincetown Playhouse in 1960s Chronological". Provincetown Playhouse. Retrieved September 2, 2012. ^ "Who's Afraid of Virginia Woolf? ", Playbill Vault. Retrieved December 15, 2015. 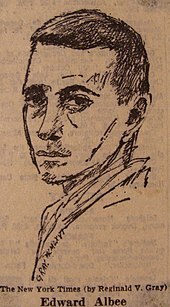 ^ "US playwright Edward Albee dies aged 88". BBC News. September 17, 2016. Retrieved September 19, 2016. ^ Kihss, Peter (May 2, 1967). "Albee Wins Pulitzer Prize; Malamud Novel is Chosen". The New York Times. Retrieved September 19, 2016. ^ "Edward Albee, Trenchant Playwright Who Laid Bare Modern Life, Dies at 88". The New York Times. September 17, 2016. Retrieved December 16, 2016. ^ "Dramatists Play Service". Dramatists.com. Retrieved May 21, 2012. ^ "Broadway's Best". The New York Times. March 5, 1985. ^ "Winners of the PEN/Laura Pels International Foundation for Theater Awards | PEN America". PEN. Retrieved September 20, 2016. ^ a b Howard, Adam (September 16, 2016). "Pulitzer Prize-Winning Playwright Edward Albee Dead at 88". NBC News. Retrieved September 17, 2016. ^ "Who We Are". The Edward F. Albee Foundation. Retrieved September 20, 2016. ^ Brantley, Ben (April 2, 2008). "A Double Bill of Plays, Both Heavy on the Bile". The New York Times. Retrieved September 17, 2016. ^ Grundberg, Andy (July 3, 1988). "The Artists of Summer". The New York Times. ^ "Mission & History". The Edward F. Albee Foundation. Retrieved September 19, 2016. ^ "Playwright Edward Albee defends 'gay writer' remarks". National Public Radio. June 6, 2011. ^ a b Pressley, Nelson (September 16, 2016). "Edward Albee, Pulitzer-Winning Playwright of Modern Masterpieces, Dies at 88". The Washington Post. Retrieved September 17, 2016. ^ Jones, Chris (September 16, 2016). "Pulitzer Prize-winning playwright Edward Albee dies at age 88". Chicago Tribune. Retrieved September 17, 2016. ^ Staff. "Albee's Loft; Edward Albee's 6,000-square-foot loft in a former cheese warehouse in New York's Tribeca neighborhood houses his expansive collection of fine art, utilitarian works and sculptures. (See related article. )", Wall Street Journal, March 11, 2010. Accessed February 25, 2019. ^ "Recipients of the Saint Louis Literary Award". Saint Louis University. Archived from the original on July 31, 2016. Retrieved July 25, 2016. ^ "Works". Edward Albee Society. Retrieved September 20, 2016.